Cardinal Law apologised for "decisions which led to suffering"
A support group for sexual abuse victims has condemned a decision by the Vatican to choose Cardinal Bernard Law to lead a Mass for Pope John Paul II. 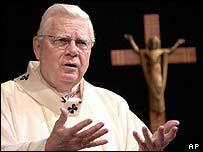 Cardinal Law resigned as Archbishop of Boston in 2002 following accusations that he covered up sexual abuse of children by priests. Members of the Survivors Network of Those Abused by Priests are flying to Rome to protest at Monday's service. Cardinal Law is scheduled to lead one of nine memorial Masses in Rome. David Clohessy, national director of the survivors' network, said: "It's an unbelievably insensitive move that simply rubs salt into the very deep wounds of thousands of abuse victims and American Catholics." The protesters plan to hand out pamphlets at St Mary Major Basilica, where Cardinal Law will lead the Mass. James Post, the president of another advocacy group, the Voice of the Faithful, said: "Cardinal Law continues to be the living symbol of the blackish blemish on John Paul II's papacy." Cardinal Law, now the archpriest at St Mary Major, has apologised for "decisions which led to suffering" and resigned as archbishop in December 2002 after being called to the Vatican. The Boston Archdiocese avoided bankruptcy by agreeing to sell land and buildings for over $100m to fund legal settlements to more than 500 abuse victims. One former Massachusetts priest, John Geoghan, was convicted of indecent assault and battery of a 10-year-old boy and was killed in prison while serving a 10-year sentence. In February 2004, a report commissioned by the Church said more than 4,000 US Roman Catholic priests had faced sexual abuse allegations in the previous 50 years, in cases involving more than 10,000 children - mostly boys. Sources in the Church say the decision on Cardinal Law probably only reflected the importance of his current post as archpriest of St Mary Major Basilica. Cardinal Law is also eligible to vote for the new pope.